Whenever I watch Lidia's Italian-American Kitchen, more times than not, I want to stop want I"m doing and IMMEDIATELY make what she's making. It's the truth! Every recipe is amazing! Here's one of my favorites. This isn't EXACTLY how her recipe is written, but it's very similar and it's the way I make it. It's quick, easy, fast, and delicious. It's just as perfect for a family week night dinner as it is for weekend entertaining. So, as Lidia always says, "Tutti a Tavola a Mangiare!!!" Everyone to the table to eat! Bring 6 quarts of salted water to a boil in an 8-quart pot over high heat. Stir the penne into the boiling water. Bring the water back to a boil, stirring frequently. 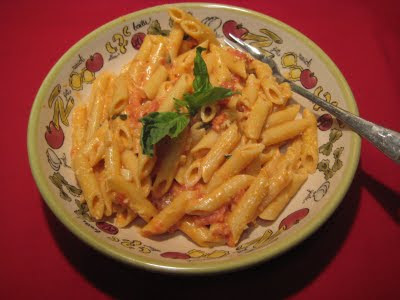 Cook the pasta, semi-covered, stirring occasionally, until done, 8 to 10 minutes. Pour the tomatoes and their liquid into a large bowl. Using your impeccably clean hands, squish the tomatoes until they're much smaller pieces but still chunky. Heat the olive oil in a large skillet over medium heat. Finely chop the onions and saute them in the olive oil. Slice the cloves of garlic (or just smash them with the side of your knife) and add them to the olive oil. Saute for a few minutes until the onions and garlic have softened slightly, making sure not to burn. Holding the bowl of tomatoes close to the pan, gently add the tomatoes to the pan. BE CAREFUL! They will splatter! Season with salt, black pepper, and red pepper flakes. Simmer for a few minutes. Pour in the vodka, lower the heat, and simmer until the pasta is ready. Just before the pasta is done, pour the cream into the tomatoes. Stir in the 2 tablespoons butter or oil. Check the seasoning, adding salt and red pepper if necessary. Drain pasta and toss with the sauce. Sprinkle the cheese and the chopped basil over the pasta and give it a good toss. Serve immediately. Choose a premium vodka. It really does make a difference. Since it's one of the main components, and also the title of the recipe, it's best not to settle for anything less. For an extra layer of flavor, you can add Pancetta or regular bacon. Simply dice it and saute it in the pan before you add anything else. I'd probably drain off the grease if it's excessive, but if not I'd just leave it in the sauce and maybe adjust the amount of olive oil. The red pepper flakes really add a sort of 'after burn' to the dish. It kind of sneaks up on you! If you prefer a dish that isn't so feisty, simply omit the crushed red pepper flakes, or just add a tiny pinch.